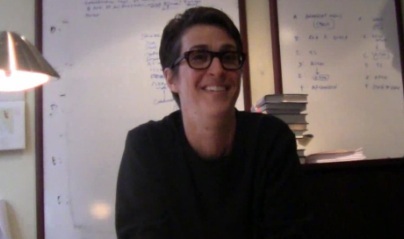 Just prior to going on the air and beating every Fox News program in the 25-54 demographic Tuesday night (and therefore, every cable news show, period), The Rachel Maddow Show host Rachel Maddow sat down with me for an exclusive interview (yes, I take full credit). In the first part of our interview, Rachel discussed the hard work that goes into making the show, the pressures of an unusual format, Mitt Romney’s foreign policy misadventures, and the nostalgic pangs of the Palin era that Romney evokes. displays onscreen is pretty much what you get offscreen. Prior to our interview, TRMS Executive Producer Bill Wolff walked me through the paces of the program’s showprep, some of which centers around a massive handwritten whiteboard. One of Rachel’s little handwritten notes on the board is about Virginia Governor Bob McDonnell, but it casually refers to him simply as “Governor Ultrasound,” a moniker she uses for him on the show. That’s not a put-on, that’s what she really calls him, that’s how he is known around the office. The Rachel Maddow you get on TV is absolutely authentic. 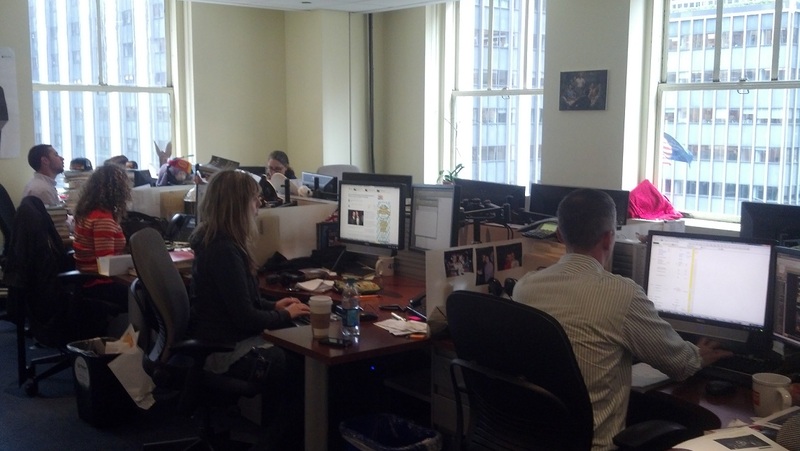 That show prep begins at around noon, as Wolff lists possible stories on that white board, while Rachel reads and writes in her office. From about 2 to 3 pm, Rachel and her staff go over the whiteboard, making notes and narrowing down or combining the stories into the six or seven segments you see on the show. From three on, Rachel and the show’s writers and producers put the show together, keeping an eye out for late developments like Monday’s Romney hidden video bombshell that throws the earlier plan out the window. Both Rachel and Wolff are quick to share credit with the staff, who are charged with maintaining TRMS’ distinctive Maddowian voice, which they accomplish seamlessly. Rachel does have a hand in all of the writing, and writes several complete segments a week, but her staff makes it seem, to the viewer, as if she has written and polished every tile in the mosaic of stories they construct every night. The storytelling method of The Rachel Maddow Show shouldn’t work the way it does. In a cable news landscape of shrinking attention spans and even smaller news cycles, TRMS requires a commitment of time and attention from the viewer that should make it a low-rated critical success at best, something people claim to watch when they’re hiding their Jersey Shore habit. Since her debut in 2008, buoyed by a strong lead-in from then-powerhouse Countdown, Maddow has delivered consistently high ratings for MSNBC, but this week may just mark a tipping point. MSNBC’s coverage of the Democratic National Convention brought in insane numbers, and it looks like maybe a bunch of those viewers have stuck around, launching TRMS past its Fox News competition in the advertiser-friendly 25-54 demo.